Spazio grande in ogni camera e al soggiorno, arredamento giovanile e funzionale!! Confort in ogni circostanza, accesso facile e indipendente! Great price for 2 bedrooms. Nice and quiet at the back of the building. Very handy for buses from and to the airport. 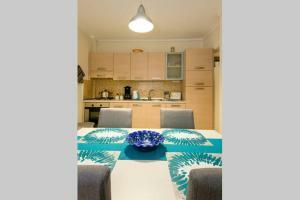 Good place for visiting Thessaloniki, good price and apartment has two separate rooms and saloon and kitchen. All equipment on board to have a good standard in Greece. Very good contact with the owner of the apartment no delays in receiving or returning the key to apartment. We liked everything. Starting the first phone call, check-in and check out hours were flexible, the communication was excellent. The flat is close to the Tower - we walked there with a 2 years old toddler and the neighborhood very safe - walked the streets until 11 pm. 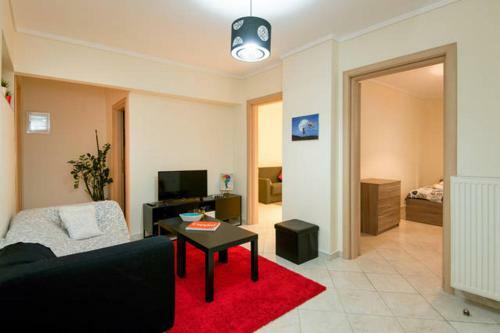 The flat is larger than you can see in the pictures and the rooms are very clean and comfortable. i will deffinetly come back again when I need to stay in Tessaloniky. Big choice of TV channels. The street outside is full of "bougatsa" stores and you can easily have a tasty breakfast ( I suggest "Bougatsa Kafe"). Super-market just accross the street. No parking space but you may be lucky and find some space around. Big rooms and fully equipped kitchen. Quite during the night. Savvas is a really kind houseowner he even brought us a welcome breakfast. The apartment is quiet. Hot water available 24 hours. 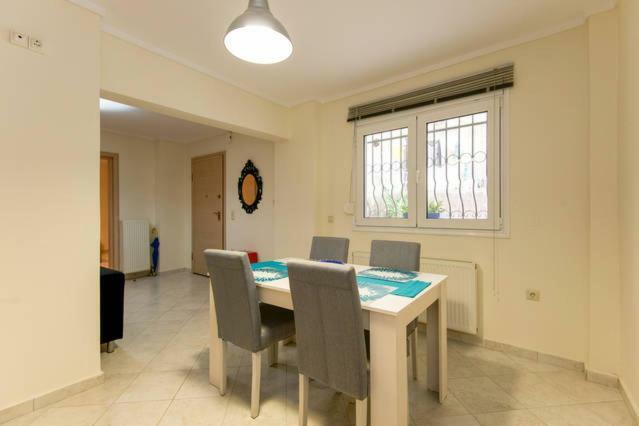 Assicurati un ottimo prezzo per Elegant City Flat Thessaloniki, valutato di recente dagli ospiti con un punteggio di 8,7. Situato a Salonicco, a 1,7 km dal Museo Archeologico di Salonicco, l'Elegant City Flat Thessaloniki offre sistemazioni con cucina. Il WiFi è gratuito. L'appartamento comprende 2 camere da letto e un soggiorno con TV a schermo piatto. L'alloggio dispone di aria condizionata e di 1 bagno con doccia. La struttura dista 2,5 km dalla Rotonda e dall'Arco di Galerio. L'Aeroporto più vicino è quello di Salonicco, a 13 km. 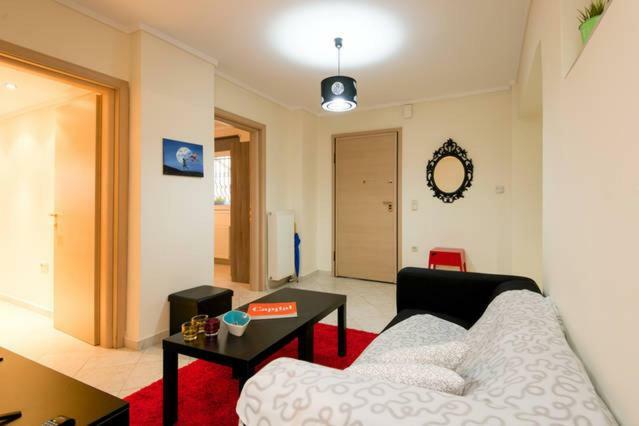 Quando vuoi soggiornare presso Elegant City Flat Thessaloniki? 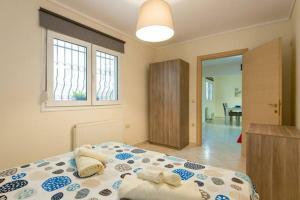 Appartamento con area salotto, patio e lavatrice. 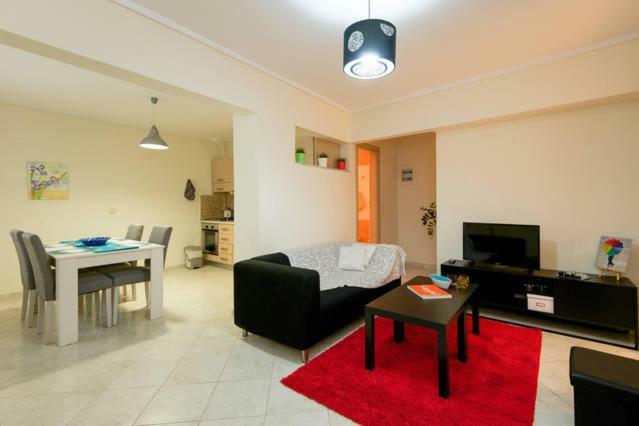 Cozy, functional and spacious 2 bedroom flat, sleeping 3 adults. The flat has a fully equipped kitchen, a sitting area with cable TV and 2 spacious rooms (one with a double bed and one with a large single). There is hot water 24/7, gas heating during the winter and also an air-conditioning unit for hot summer days. It is a ground floor flat with an independent entrance, offering convenient 24 hour access. It has view to the back yard and you may check in even later using the safe deposit key box. I live in Thessaloniki and would be happy to assist you to explore this beautiful city! The flat is on the ground floor, private with its own entrance , conveniently located and close to shops and supermarkets. The neighborhood is a typical residential one, very lively with plenty of shops, supermarkets and cafes around. There is a pharmacy next door and a bus stop just across the road. It has excellent bus connections to the airport and the whole city. You can even walk to the city center or enjoy a stroll on the new promenade, which is only 5 mins away from the flat. 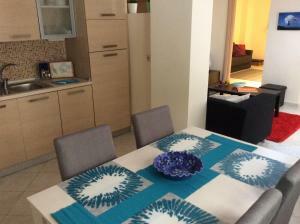 Leggi prima di prenotare Elegant City Flat Thessaloniki accetta le richieste speciali. Aggiungile nel prossimo passaggio! La pulizia viene eseguita solo prima del vostro arrivo e non durante il soggiorno. Questa sistemazione è un appartamento indipendente, non dotato di reception. Siete pregati di comunicare in anticipo a Elegant City Flat Thessaloniki l'orario in cui prevedete di arrivare. Potrete inserire questa informazione nella sezione Richieste Speciali al momento della prenotazione, o contattare la struttura utilizzando i recapiti riportati nella conferma della prenotazione. Un po' di umidità visto che pioveva due giorni dalle quattro. Forse colori ai muri antiumido o una struttura esterna stabile che blocca la umidità! Il proprietario non è venuto personalmente ad accoglierci e la ricerca delle chiavi non è stata facile. L'appartamento è al piano terra ed entrano facilmente insetti e formiche.